“Quirky” and “Primitive,” said someone at the Bluebird Café in Nashville. “A little bit honky-tonky,” said someone else. “Pure Mountain,” said another. 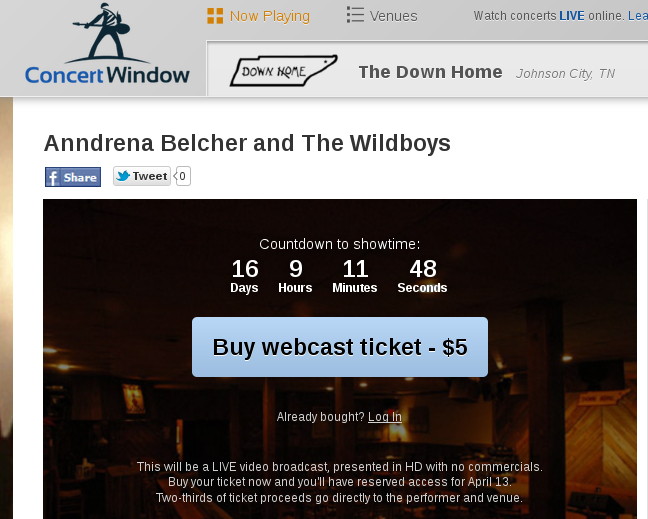 Anndrena and the Wild Boys will be playing at the Down Home in Johnson City, Tennessee, on April 13 at 8 pm. This is a perfect opportunity for those of you living further afield to hear Anndrena's original songs since she will also be streaming the performance via Concert Window. For a $5 fee, you can enjoy the webcast from any location across the country or around the world.